You must be a registered member with a trade journal in our private trade journal section to view other broker profit loss statements in my private trade journal along with other images for any other trading day after July 11th 2018 or you can just click on the dates in the calendar to the right to view the archived text log of the free chat room for any trading day since 2002 where members of TheStrategyLab are posting their real time trades and real time price action analysis so that there's more eyes on the markets...not your typical chit chat room. The above image excerpt is the broker profit (loss) statement, real-time chat room trade posts and price action analysis. It's an image from my center monitor of a multiple monitor setup...representing my most recent price action trading results for either the Emini ES futures, Eurex DAX futures, Emini RTY (TF) futures, Light Crude Oil CL (WTI) futures, Gold GC futures and EuroFX 6E futures for my most recent trading day via the online user name wrbtrader. Currently, I'm mainly trading Emini ES futures while watching other key markets (e.g. Treasury ZB futures, Eurex DAX futures, U.S. Dollar DX futures, Forex EURUSD currency) to help with my intraday volatility analysis, inter market analysis, intra market analysis of the overall market conditions on any given trading day. It also helps me to provide good support to clients using Advance WRB Analysis Tutorial Chapters (price action analysis) or Volatility Trading Report VTR (trade signal strategies) to trade other markets. Our services are tax deductible. First of all, I will get straight to the dirt. March 3rd Sunday evening to March 8th Friday afternoon...there was a futures trading competition. This was my first futures trading competition and I only enter the competition after persistent requests by three other Advance WRB Analysis Tutorial Chapters 4 - 12 clients that I've grown to trust the past 5 years...two I've personally have met and consider them to be personal friends. The competition occurred was marketed as "trade against a Pro" trader named Bobby Iaccino of Path Trading Partners...a professional trader. I first heard about Mr. Iaccino back in 2002 from a close family friend that lives in Chicago. Also, I've seen Mr. Iaccino on many different financial news networks: CNBC, CNBC Asia, Bloomberg Television and radio, CNN, CNN International, CNN Moneyline, Fox Business News, First Business (Canada) and Phoenix TV (China). Where Should You Begin Your Price Action Trading Learning ? First, we highly recommend you read our risk warning prior to doing any further trading and prior to using TheStrategyLab.com resources @ Risk Warning. Next, you must begin your price action trading analysis learning via our free study guide @ WRB Analysis Basic Tutorial Chapters, free real-time chat room @ ##TheStrategyLab. Also, if you don't have your own trade signal strategy to use with the WRB Analysis Tutorial Chapters, you can freely use one of our trade signal strategies @ FVB Basic that exploits key changes in volatility regardless if its intraday volatility analysis or volatility analysis on larger time frames. These free resources will give you the basic concepts (foundation) to price action trading via WRB Analysis and will help you to improve the performance of your own trade signal strategies and/or improve your understanding of the price action you're preparing to trade whenever volatility changes. Also, the above free resources are for your due diligence prior to you purchasing our fee-base resources called WRB Analysis Advance Tutorial Chapters and Volatility Trading Report (VTR) price action trade strategies. Advance tutorial chapter 4 will give you a stronger and advance understanding of the price action (market context) to help you identify price areas called WRB Zones that represent key changes in supply/demand so that you can exploit these key changes for profits via whatever trade signal strategy you're using that appears within the WRB Zones. Also, the objective rules of the price action trading definitions for the WRB Zones in the advance tutorial chapter 4 are clear along with about 28 chart examples to help ensure you understand the objective rules. In addition, there are lots of chart examples from other clients via their "demonstration of knowledge (DOK)" of their trading instruments as day traders, swing traders and position traders. Further, we provide you with a learning/application route guidelines so that you know what you should be learning and when you should be learning it as you navigate difficult market conditions such as low volatility or high volatility. To learn more about the advance WRB Analysis tutorial chapters 4 -12 and the pre-qualification to gain access to our fee-base education resources...click here. Our most recent fee-base client in April 2019 is Wizzle...he/she is trading AEX, FDXM and Emini ES futures. June 21st Wednesday - (DOK Chapters 1, 2 and 3) - Demonstration of knowledge (DOK) by WRB Analysis user member NickA...continue reading. If you have doubts about the merits of using key changes in volatility and key changes in supply/demand via WRB Analysis to identify profitable opportunities or any doubts about our support to help other traders...you're welcome to use our free resources for your due diligence prior to purchasing any of our fee-base resources. February 20th Wednesday - (DOK Chapters 1, 2 and 3) - Demonstration of knowledge (DOK) by WRB Analysis user member Wizzle...continue reading. TheStrategyLab.com communicates with traders without spamming nor soliciting nor baiting. Simply, they contact us first although we prefer that traders contact us in our own backyard here at TheStrategyLab. We use the user name wrbtrader at social networks such as @ StockTwits, @ Twitter, @ ##TheStrategyLab chat room, @ TSL Support Forum, @ EliteTrader.com, @ Traderslaboratory.com, @ Futures.io, @ ForexFactory.com. Introduction - Simple definition: Price action trading is a trader that doesn't use technical indicators or technical studies for trade decisions...There are two basic groups of price action trading...continue reading. WRB Analysis Tutorial Chapters 1 - 12 helps give you that market context to understand the price action you're trading prior to the appearance of any trade signal strategy you're using. If you're using our trade signal strategies (VTR, STR, APAOR, AJCTR, FVB and DCM), these strategies are rule-based (objective) and they exploit changes in supply/demand via volatility analysis regardless if the market conditions are fast changing price actions, trend continuations, trend reversals, pullbacks, range, low volatility or high volatility. To ask questions about our trade methodology at our TSL Support Forum...click here. To find more information about our refund policy...click here. Technical Analysis Disclaimer - There's more to profitable price action trading than just technical analysis. If you don't understand...click here. * ES, RTY (TF), DAX, NQ, YM, EuroFX futures were all traded in year 2006 and 2005. In comparison, I now only concentrate on one trading instrument at a time. IRC is used because it has different types of software to use for logging into the chat room with fewest disconnection problems for users including many types of mobile apps and its not a memory hog like other chat services. Currently, I'm exploring other types of chat programs that's suitable for traders around the world that have become available the past few years. I hope to implement using something new by December 2018. Log-in instructions for the free chat room...click here. 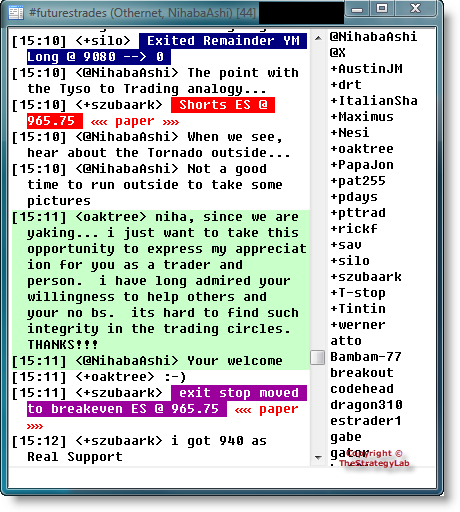 Yet, if you only want to read the archived chat room logs of price action traders...click here. Archived since 2002. *Holiday, vacation or chat room closed. TheStrategyLab has a new trade journal section for member @ Members Trade Journals and Private Threads. Trade Journals helps traders to stay in the present. They will help you overcome a critical psychological barrier to success...letting prior wins/losses affect the now. Your journal of your trade performance (simulator or real money) will allow you to set goals and give you immediate feedback when you complete your trading day. Thus, your trade journal allows you to be an active learner, adapting and determining what you do well and why you do it well. Also, it will give you the tools to determine what you should be doing better and how...empowering you to develop future goals and targets...giving you the tools to achieve your desired outcome in your trading. Join our forum and then request access to the private section of our free forum to start your own trade journal or private thread in a well moderated forum environment. Simply, we keep the trolls away while you journal your trading along the rode to successful trading. Most of our resources are free for you to review and apply for your due diligence prior to purchasing our advance resources involving price action trading. The primary goal of WRB Analysis is to help improve your understanding of the price action you're trading and/or help improve your trade results of your own trade strategies while using TheStrategyLab. The highlighted testimonial with our broker PnL statement from screen sharing is just one of many traders that benefited from our resources although we do have a few users that are not satisfied. To read other accolades...click here. Trading Classic Chart Patterns and is by Thomas Bulkowski and there's no overlapping with his other book called Encyclopedia of Chart Patterns. Yet, just be aware that his results are via his trade method and will differ in the results from someone else that has a different trade method for trading the same pattern. Trade What You See: How To Profit from Pattern Recognition and is a book I saw mentioned by traders from our social network that are posting at other forums about AB=CD, gartley and butterfly price action patterns via fibonacci numbers . Different trader books are being highlighted above and there are more recommended books by other traders to help with understanding and application of price action trading. Thus, you can join our TSL Support Forum to post your own personal reviews or recommendations @ Trader Books. Follow our recent Stocktwits price action commentary on futures, forex and stocks via the user name wrbtrader. TheStrategyLab.com Disclaimer - The Strategy Lab. All rights reserved. The Strategy Lab is neither a registered broker-dealer, investment advisory service nor an investment advisor and does not purport...continue reading. Analysis of wide range body or bar (WRB Hidden GAP) is the most efficient way to exploit changes in supply/demand, high volatility or increasing volatility for profits. 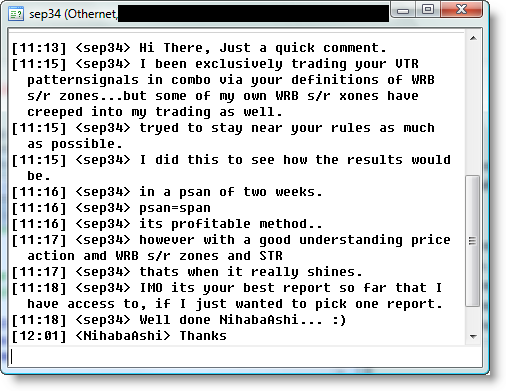 "...I been exclusively trading your VTR...its profitable method...however with a good understanding price action and WRB s/r zones and STR...thats when it really shines..."
"niha, since we are yaking...i just want to take this opportunity to express my appreciation for you as a trader and person. i have long admired your willingness to help others and your no bs..."
"Your material is exceptional, its REVOLUTIONARY, seriously." 6658 registered traders have downloaded the free WRB Analysis Tutorial Chapters 1 - 3 study guide since 2008 and 76% say the education content of WRB Analysis is useful. 495 registered traders have purchased our volatility trade methodology since 2002. Currently, via brokerage statements & quantitative statistical analysis posted by free users and fee-base clients of WRB Analysis, 70% are profitable. Traders that do not see an improvement in the performance of their trade signal strategies while following the instructions of WRB Analysis represent about 12% of the users. Traders that do not follow the instructions of WRB Analysis that requires them to document their trading via brokerage statements & quantitative statistical analysis, they struggle more than all users and they represent about 23% of the users. Recommend other traders and you'll earn 10% to 25% and free access to our trade strategies when they purchase our trade methods @ Referral Program. A few traders in our referral program are earning about $165 per month via recommending TheStrategyLab.com to other traders. Updated information and rules @ Referral Program. Guest visitors are allowed to vote! Q: Which discussion forum do you prefer to use? Q: Which twitter services are useful resources for traders? Q: What do you primarily trade? Q: Which impacts your trading instruments the most? Q: Which do you prefer to use for real-time collaboration with other traders during trading hours? Guest visitors are allowed to vote (registration not needed). However, all commentaries by traders will be reviewed (moderator queued) prior to being approved for viewing. To see all polls related to trading, economy, wall street, global markets et cetera...click here. It's a known fact (has been proven) that when we listen to music while working, we accomplish more work and release more stress along with having a more positive outlook on our jobs and life. Music is an aid for positive change in our moods, emotional and psychological states...healing power of mind, body and spirit that's faster in comparison of such without music. This is very critical especially if you...continue reading. Copyright © 2002 - 2019. The Strategy Lab. All rights reserved.